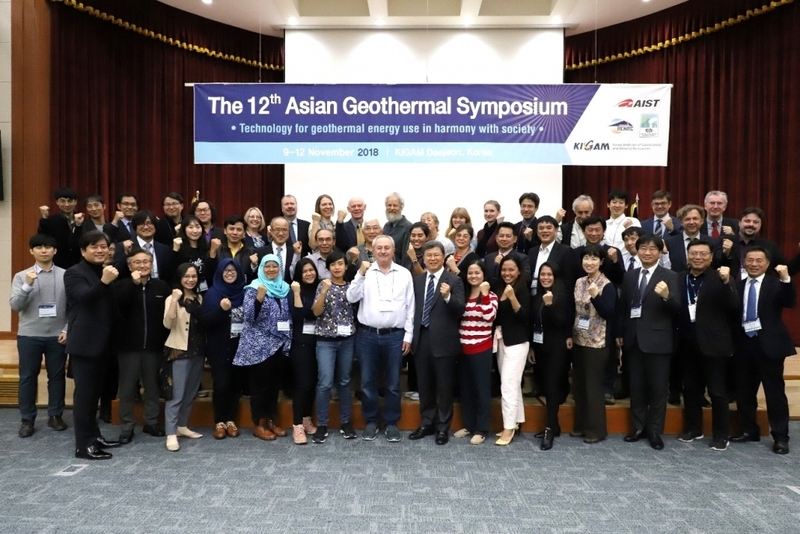 The 12th Asian Geothermal Symposium (AGS12) was held at the Korea Institute of Geoscience and Mineral Resources (KIGAM), Daejeon, Korea on 10-12 November 2018, co-organized by the National Institute of Advanced Industrial Science and Technology (AIST) and KIGAM, with the support of the Asia-Western Pacific Regional Branch (AWPRB) of IGA. AGS12 was attended by 85 participants, and had the theme “Technology for geothermal energy use in harmony with society.” This unique international symposium aims to encourage technical information exchange to promote geothermal energy use in the world, especially in Asian region. Prior to this symposium, a geothermal workshop “Geothermal Direct Use for a Green Economy” was held by the International Energy Agency-Geothermal Technology Collaboration Program (IEA Geothermal) on 9 November at the KIGAM campus. The participants visited Sejong Special Autonomous City to see huge ground-source heat pump (GSHP) systems on 10 November. Then the AGS12 sessions followed on 11 and 12 November. Both AGS12 and IEA workshop were open to anyone who are interested in technology related to geothermal energy use. In the opening session of the AGS12 on Day 1 (11 November), a welcome speech was given by Dr. Yoonho Song on behalf of Dr. Bok Chul Kim, President of KIGAM, stressing that AGS12 is held at special occasion of KIGAM’s 70th anniversary of its foundation, and 100th anniversary of the Korea Geological Survey. 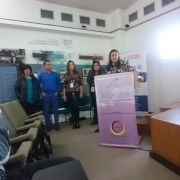 Dr. Kasumi Yasukawa, AIST, gave the opening notes, mentioning that it is the second time to hold AGS in KIGAM and that since the last time in 2004, AIST and KIGAM have been co-sponsoring AGS with a strong partnership. During the lunch time of Day 1, the Annual General Meeting of AWPRB-IGA was held at the venue led by Dr. Toshihiro Uchida, AIST. On 10 November, AGS12 participants visited Sejong Special Autonomous City to see gigantic GSHP systems in the City Hall and research institute buildings. It should be noted that most of the government buildings have been moved from Seoul to Sejong recently. The government building complex in Sejong is divided into three zones and total building area reaches 607,555 m2. Total installed capacity of GSHP exceeds 20 MWth and covers more than 38% of heating and cooling load of the buildings. 70% of geothermal energy extraction is from borehole heat exchangers through 1190 boreholes of 200 m deep; the total length of all the wells reaches 238 km. 30% of heat exchangers are using ground water wells of around 400 m deep. Zone 1 of the building complex started its operation in 2012, Zone 2 in 2013 and Zone 3 was completed in 2014. GSHP for other public buildings including the City Hall, research institute buildings, etc., in Sejong City have also been recently installed. After visiting Sejong, AGS12 participants enjoyed a short trip to Gapsa Temple in Gongju, where autumn color and traditional Korean architecture welcomed them. All technical papers presented in AGS12 are uploaded to the IGA Geothermal Paper Database. Organizers are very grateful to IEA Geothermal because holding AGS symposia in conjunction with the IEA geothermal workshop attracted many participants from Asia, Oceania, Europe and North America.